Packrati.us auto-adds links you post on Twitter to Delicious (with advanced options including hashtag conversion) Awesome! In the future we could be using gestures and our skin to interact with machines. Wow. Zen Habits has some useful advice on 13 small things to simplify your workday. Number 2 is über-important in the long-term! Need to free up some space in your wardrobe? Here’s a simple hanger trick for weeding out the stuff you don’t wear often. Stammy shared a great tip on Twitter about email productivity: “when someone sends me an important email but has little text, i reply to it to myself to add keywords, so i can search for it easily later.” Great idea! 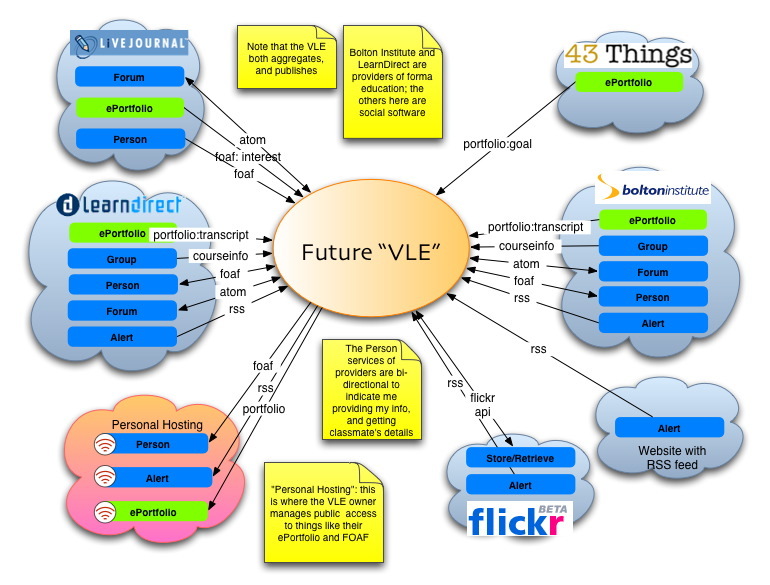 James Clay thinks that VLEs (Virtual Learning Environments) in the future will look something like the below diagram. A bit technical for the average educator, but nice! The trouble is when you see things like Reading in the Digital Age is that, unless you know the background of the author, you take his opinions seriously. I happen to have read Sven Birkerts’ The Gutenberg Elegies which is a few hours of my life I’ll not get back. File under ‘people with some status who just don’t get it’. Want to create an infographic but haven’t got an ‘angle’ on some data? Try this post Themes For A Good Infographic! Need to make a large number or statistic more tangible to your audience? NumberQuotes is good for that. For example, I’m 29 which is same wage, in dollars per hour, as instructional coordinators make in the US. I was at Stansted airport on Wednesday when someone official-looking tried to stop me to “ask me two questions”. As is usual, I said a polite “No, thank you” and walked on. She proceeded to follow me, asking me what I was doing walking past her. I explained I wasn’t interested, at which point she said “I’m from the government”. I asked (admittedly, sarcastically) if she was going to lock me up. She looked bewildered that the “I work for the government” line didn’t work on me and stood in front of me. I still didn’t answer her question and walked around her. And no wonder when the ‘representatives of the people’ (that I didn’t vote for) are going to push through an unwanted Digital Economy Bill and change the law to be able to open people’s mail without them being present. Democracy? Pah! Taberinos is a very addictive, simple snooker-like geometric Flash game. And I can’t believe that nobody told me about the amazing Angry Birds iPhone game! Need to collaboratively browse and chat online? (who doesn’t?!) Try Nurph! Wikipedia a bit too bland for you? Try VisWiki! Next #uppingyourgame v0.5 now available!